Hey guys! I've been thinking about making a post about who I am / what I do apart from blogging for a while, but I've always been reluctant because... I don't know, what if no one cares? What if I make a post saying 'ask me questions and I'll pick some to answer' and I get zero comments... it'd be embarrassing. Also, I want the focus of this blog to be books and not me. On the other hand, I feel like I haven't connected to the rest of the community to the extent that I'd like to, and maybe sharing a little might help with that and start a conversation. 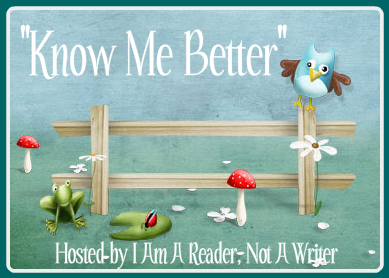 So I've decided to occasionally take part in the new meme Kathy from I Am A Reader Not A Writer created where bloggers can answer 5 questions she usually asks in her author interviews. This changes a bit depending what's on, but: Vampire Diaries, True Blood, Game of Thrones, Supernatural (only seen the first two seasons so far), Criminal Minds, Bones (seen up to season 5)... I think I'm forgetting some. I've been meaning to get into Carnivale, Revenge, American Horror Story, Downtown Abby, but there's no time. Haha, no way XD I have no interest in ordering others around, I'm lazy and disorganized, I don't like being the one in power (I'm not a mindless follower either. I'd be the right hand woman or something). I also don't want to spend my life expecting to be stabbed in the back. Nor do I think I know what's right for other people/the world. To each their own. My first boyfriend, about a week after I turned 17. He lived 2.5 hours away and I was spending some days with him at his family's house over the winter holidays because usually we could only see each other every second weekend. I think it was even on the eve of Valentine's Day! We'd just finished watching The Crow, the credits were rolling, and it was really late and we were lying on his bed staring at the screen. I was so nervous I didn't really get to enjoy it all that much and it was sort of... less... than I had hoped. I'm a very boring person. I don't really go out much, also because I can never do it on Fridays because I have to get up at 7 a.m. Saturday morning to go to work (I tutor groups of kids on Saturdays for an organization, and I have a different job in addition to my English Lit studies during the week). So I basically just read a lot, hang around on the internet, maybe watch TV (rare), go for coffee with my writing, a book, or a friend, sometimes visit my family, listen to music and go to concerts (I love metalcore and... you know... other genres where bands scream at you, you get awesome guitar solos, and people mosh instead of girly-scream at the lead singer). Thanks for participating. I hear you on the nerves and not really enjoying it. My first "real" kiss was similar. Revenge is such a great show...I love it. And yay, Supernatural and Vampire Knight! Wow, I've never heard of most of those shows! I guess we don't watch the same shows. I don't think I've watched "real" anime either. I don't really know much about it but I don't think anime is every Japanese cartoon. I've seen one (don't know if it qualifies, I don't think is like others I've heard about) it was called Uninhabited planet Survive, I really liked it though. I like the words you chose to describe yourself...I think we'd share quite a few of them :) I'm planing on getting into The Vampire Diaries very soon - can't wait! As far as anime, have you ever heard of Avatar; The Last Airbender? >.< Thanks for sharing this girl, it's a cool feature! Here it's just that I think most people are here because of books and not because of me so I felt a bit reluctant because I wasn't sure anyone would actually care / want to know.